Talked our way onto an exclusive golf course in Los Gatos. They gave us carts to go out on the green. Heading out to the painting site. Never driven one of these Things before. Erich Neubert, Bob Frank, and Brenda Boylan, all painting the 14th Hole. 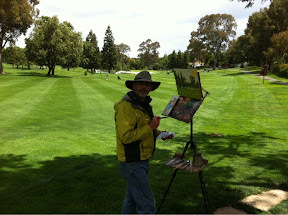 Me, painting the 14th Hole. A closer shot with the painting. Mid day was spent touching up paintings and a little meditating. 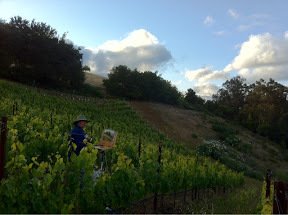 Then up to mountain view winery to paint the sunset. Bob Frank in this photo. I'll work this painting for two nights. Something I haven't done for a while. Could be a good one if I don't kill it. What a fun post! If I were out there all I would see is a field of troublesome greens. 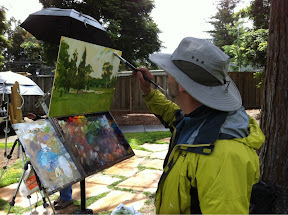 I started reading your blog 3 years ago, when I first picked up a brush, then lost you among the sea of all the other painting instruction stuff I fell into. I happened to click on you again recently, and re-read some past posts, and understand them much better now- so many levels, so little time! I wanna drive a golf cart! Judy. thanks for your kind words. 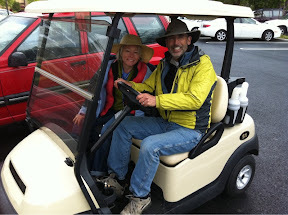 Sis, driving a golf cart was fun but there is a governor on it so you can't speed. Took a while to get to the 14th hole. 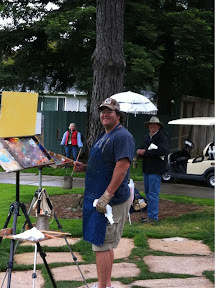 Hope you didn't get hit by any errant golf balls out thar..looks like you were working on a very nice painting for sure. thinking of you in all this stupid rain. stupid jet stream.